The plot thickens. Well, the stack thickens. Tech firms met with government agencies and nonprofits for their speed-dating matchup Wednesday, known as the Greater Portland Tech Challenge. This is an event organized by Greater Portland Inc. and the Technology Association of Oregon. Agencies had four minutes to outline a challenge, then tech companies had equal time to say what kinds of solutions they might offer. After a series of break-out sessions the two sides could pair up and agree to work on a pilot program. 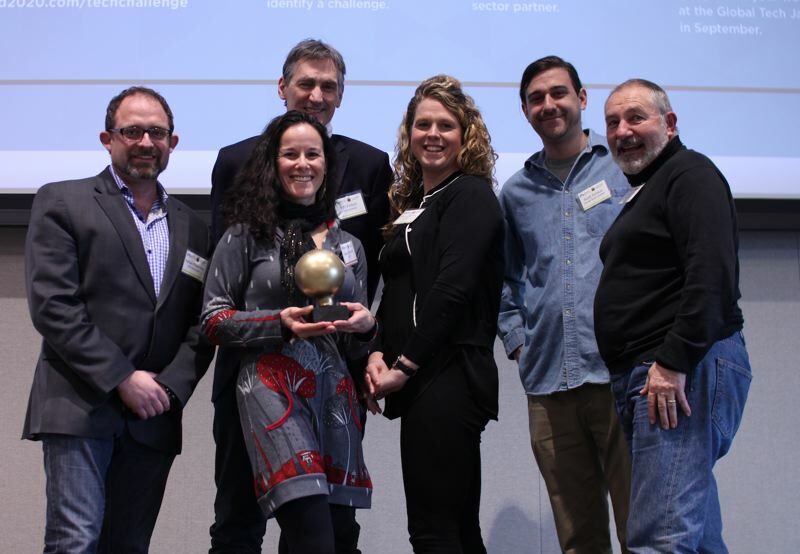 The agencies marked their commitment by awarding the tech companies gold (painted) light bulbs. Last year's challenges had to be about transportation. This year, it was blown wide open. The theme was anything to do with smart cities, that is cities where government uses data to better deliver services. 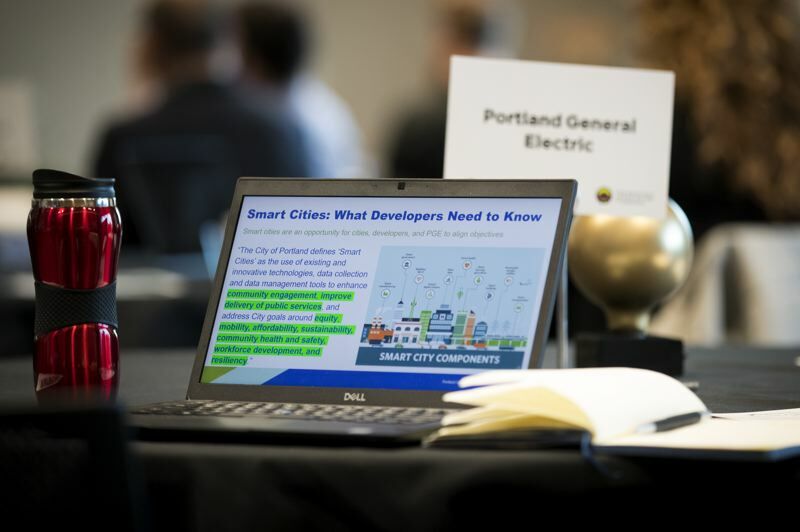 Lloyd Purdy, VP regional competitiveness at GPI, told the Business Tribune they were "exploring the ecosystem of smart cities, technology and how solutions can solve civic challenges, and how equity and inclusivity can be an integral part of smart cities problem solving. This year we're exploring the whole range of challenges." Going first for the public sector was Eliot Rose, a technology strategist at Metro. He said the regional planning agency, which coordinates transportation planning and investment for over 20 cities, wants to stop looking at congestion only by getting data from cars. Showing a map of GDP growth where burgeoning cities had spikes above them representing growth (Midland Texas was top in 2018, with 24 percent) he said "We're not just looking for data, we're looking for storytelling: how to get from a picture of congestion (a stock photo of cars in traffic) to what (people) can do about it." Explain briefly the market demand for a solution. What resources will you commit to a demonstration or pilot project? Rose said that Metro is looking for a way to gather more accurate sources of data about the movement of freight and people around Portland, and "ways to tell compelling stories" about it. In exchange the tech firms would get access to Metro staff and data collected by the likes of TriMet and Portland State University's Portland Project. In a similar vein, Jarvez Hall, director of the East Metro Economic Alliance, said east Portland needs more north-south transit connections. He said that despite all the new jobs at places like Amazon and ElementSix, some people weren't applying because they don't have cars, and most of the transit options run east-west. He proposes a multimodal transport hub at Mt. Hood Community College. 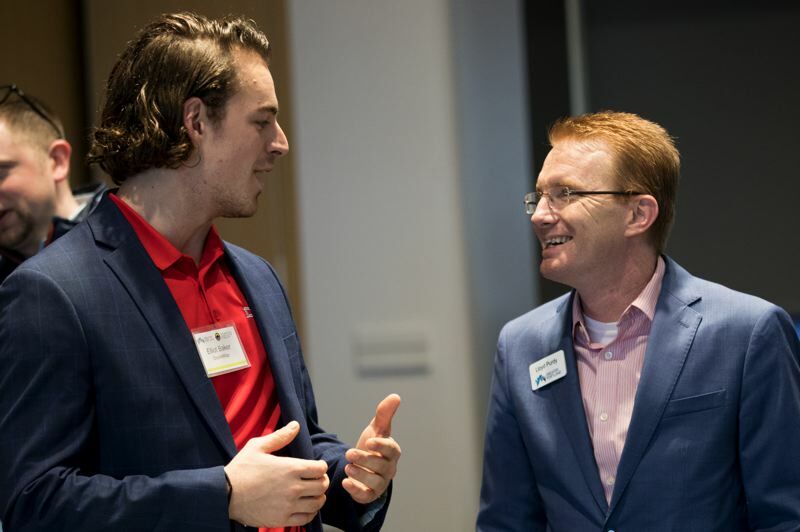 "It is central in the east metro region, and connects employers and education. It can be the crown jewel of the region." An interesting thing about the Tech Challenge is how it surfaces things that are going on in local government that have had very little publicity. The Portland Bureau of Transportation's Sarah Goforth talked about a project she runs called the Transportation Wallet. A total of 1,900 wallets were issued in 2018 and they expect to sell 2,000 this year. Whereas dealing with parking permits and bus passes was once a labor-intensive process, now consumers expect more — and they expect it instantly. Goforth said one problem is the applications have to be hand-processed and only during office hours, they can't offer variable pricing, and they can't verify eligibility in real time. Another problem is it's confusing that to buy the wallet online you have to go to the Biketown site. PBOT would also like to extend it to include scooter rides and other modalities. "The wallet is scaling up but the staff is not," she noted. Whoever could offer a software solution would be allowed to "white label" it and sell their work to other cities. They would get time with PBOT staff and the cooperation of the Wallet team. 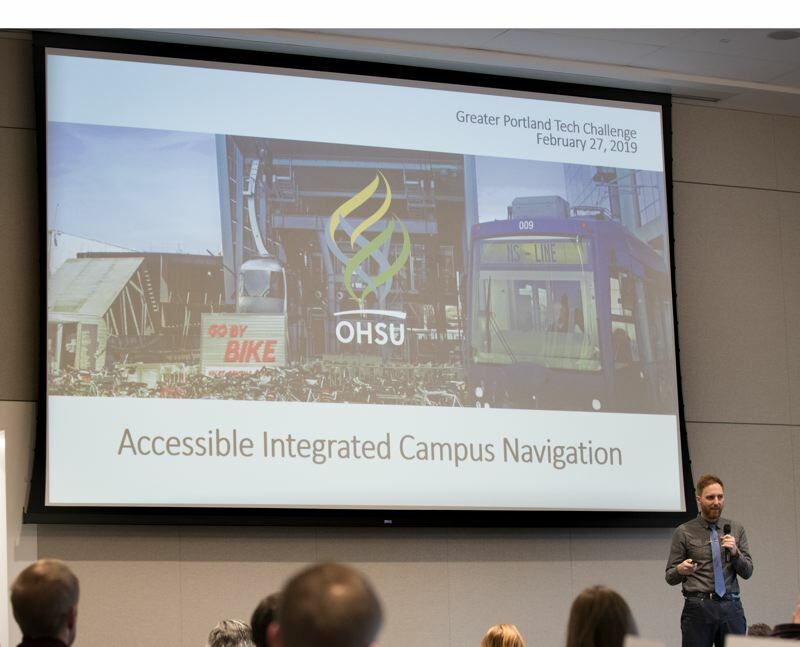 Oregon Health and Science University pitched their campus as the challenge: with 33,000 jobs, annual economic output of $4.3 billion and 500 hospital beds, the campus is hard to navigate. And that has proven to be off-putting to potential patients. Things like poor wayfinding (signage) can put people off permanently. OHSU has Trip Tool 1.0, which sends people an email full of links for how to get between two points. They want more functionality, but they know people don't want to download yet another phone app to find their way around the hospital. The speaker, John Landolfe, said what they need is a back-office solution. He offered the incentive that a lot of other campuses need similar digital mapping, so the work could be reused. He also said that OHSU had a large budget and with its tram and bike valet was known for being different. There are low-profile nonprofits whose work is becoming a tech challenge. Explore Washington Park, a five-person team run by Heather McCarey, gets most of its funding ($1.5 million) from the $3.2 million that is raised by parking meters in Washington Park. The money pays for the April to October shuttle bus service and marketing campaigns to get people to use the park — particularly low-income families. "We do surveys and intercept people," said McCarey, but we don't know who's coming on a daily basis." One challenge is finding out whether families who received free transit passes actually used to come to the park. That's because passengers swipe in, but they don't swipe out. They want to know how many people are coming by MAX each hour and what their demographics look like. In return, Explore Washington Park was offering staff time and the feel-good factor of contributing to its equity mission of "increasing access to the park for all." Ryd, a non-profit part of LSW Architects in Vancouver, Washington, has three electric vehicles that look like stretch golf carts. They were designed for staff to dump their cars and make the last part of their journey downtown by Ryd, since Vancouver's parking situation is getting frustrating. It operates rides downtown between 8.30 a.m. and 4.30 p.m. Ryd — short for Rethink Your Drive — needs a back-end software system that can handle ride hailing, in the style of Uber and Lyft. As opposed to texting the driver, which is what customers do now. Explore Washington Park CEO Heather McCarey explained her goup's challenge, in the hope that some kind of technology can help. "If we do a big marketing push it's hard to know whether it increased ridership that particular day." Asked if they knew what they wanted or whether they were hoping some tech firm would come along with a brilliant idea, she said the latter. "We have a lot of data, all our parking meter data, our APCs, automatic passenger counts on our shuttles, we're able to tell our story 70 percent, it's the other part: Did we immediately have an impact when we gave away these passes? That's the story we're not telling right now." Explore Washington Park has focused more on getting west-side transit users (including low income ones) to the park. Being one stop away from the Sunset Transit Center is a lot more convenient than a Gresham train which has to roll slowly through downtown Portland. They have started using a calendar to tell people when it might be wise to leave the car at home, such as certain summer days and Zoo Lights nights. Another part of the job is just educating people that the Zoo and the International Rose Test Garden are in the same park. Her organization's vision is to increase access, and more. "We see ourselves as the Central Park, the Golden Gate Park (of Portland). We want to elevate it and make it world class. If you come to Portland you're spending the day at the park and here's what you're going to do." The tech companies then pitched their goods and services. Wilf Pinfold, CEO of urban.systems talked about the circular economy and how solutions do not happen in isolation. Data integration — or sharing data, or connecting data silos — is a large part of the urban.systems vision. But some of the pitches used plain text PowerPoints, and many were general accounts of the "solutions" they provide. Christopher Eaton of Append Media said they make custom applications for organizations and help internal processes. Maxime Paul of MHP Americas Inc. said they make data systems software and solutions. "We test, discover and build. It's an iterative process." 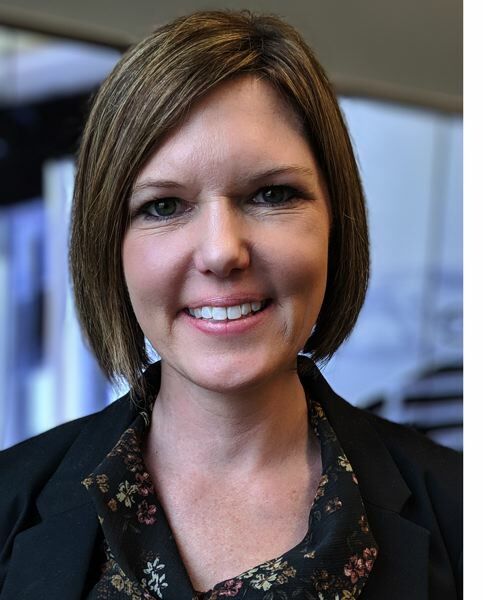 Moovel's business development director Kathryn Mullins talked about the company's "no congestion" vision and its "end-to-end solutions across modes." Trillium's Thomas Craig said the company "makes transit easier to use" and summed the staff up as a "bunch of Portland transit nerds." Elliott Baker of Indianapolis-based DoubleMap said they automate ride dispatching and pooling, and are already working with C-TRAN, and with the bus system called Lynx in Orlando. Afterwards, Pinfold told the Business Tribune that the tech companies were probably pitching in very general terms to keep their options open of whom to work with. He had his eye on the OHSU and Explore Washington Park challenges. "What was really interesting, people like OHSU they understand that any smart city is a lot of services, and we're not going to have a lot of apps on our phone, a lot of siloed things. Like when you bring a Bird bike in, you want to be able to see that Bird bike on Google maps and be able to book it from there. I think people are starting to understand the importance of having an integrated data back end." Pinfold said the community has grown and the challenges are much more sophisticated. He believes autonomous vehicles are the future, mostly because the driver is two thirds of the cost of having a vehicle. "We should be more agile about taking the resources we have an using them to deliver set of services at low cost for the city. We're not doing it well but we're doing it better than other cities." Skip Newberry, president and CEO of the Technology Association of America was pleased that the challenges cover more policy areas this year. "A lot of the challenges are multifaceted," Newberry told the Business Tribune. "Something that looks on the surface like its energy or building systems, actually includes other policy areas, such mobility." Newberry was glad that firms from outside Portland were showing interest. "They can refine how they might work more with a government. It's a little easier when you have that face to face than when you reply to an RFP through a blind portal." That's new and worth exporting. "It's positioning this region as an innovator when it comes to public-private interactions and partnerships." Purdy of Greater Portland Inc. said it's now up to them to work together on the challenges and see if they can come up with a workable pilot program. He will check in during the coming months but at this point the are independent of GPI. Last year, six pilots came out of the tech challenge and he expects to exceed that number in 2019. Teams will present at the Global Teams Tech Jam in September 2019, an international event organized by the Technology Association of Oregon.